Italian guitarist and multi-instrumentalist Donatella Canepa honours the art of shredding on her progressive post-grunge mini album L'Orizzonte Degli Eventi. She kicks off the procedures with the cinematic Marcia a Oriente . If Ennio Morricone would have into hard rock this it what he would have come up with for a particularly bloody Western, Canepa keep the momentum going through her short and sweet excursions, nodding to dance rhythms in DJ Attacco and updating the classic use of contrapuntal techniques in the fast and furious Fuga. Canepa has reinvented herself. 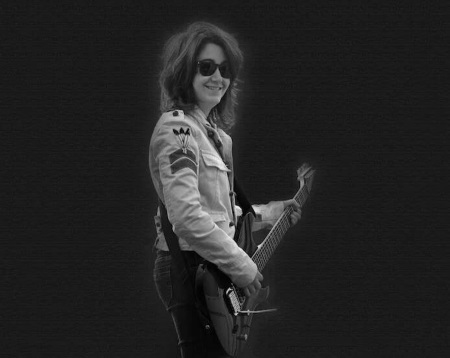 From being classically trained musician - three years at the Filarmonica Citta' Di Chiavari in Genoa - she is now a rock guitarist, who can put theory into something loud and invigorating. Progressive rock can blossom within the space of three minutes or less compositions. Have fun dissecting her ideas, but first and foremost, enjoy the ride. L'Orizzonte Degli Eventi is a self-released album. Buy it from her website.